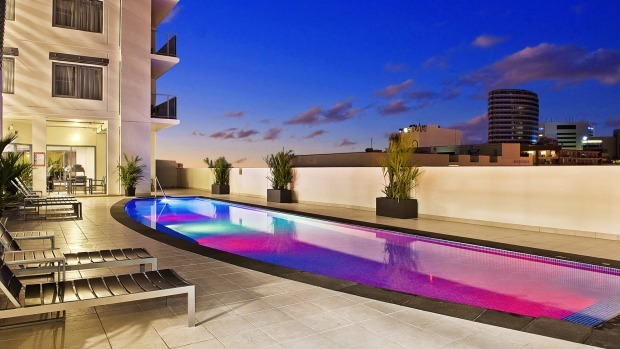 Elan Soho Suites' pool may be too cool for most Territorians. 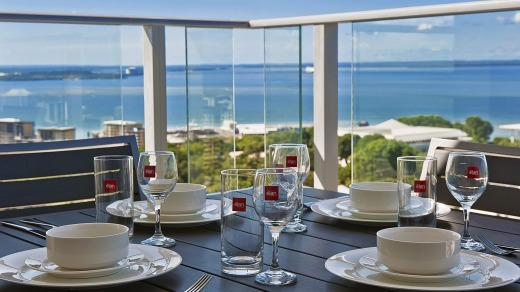 Elan Soho Suites is in Darwin's CBD, five minutes from Smith Street Mall and a 10-minute walk down to the waterfront. The 4½-star hotel, which opened in December 2014 has 301 rooms. Originally planned as an apartment block, it morphed into a hotel part-way through construction. Like the forest of small high-rises around it, don't expect any architectural masterpieces, or even a lavish lobby, which indicates its original intention: it's pure business here. Choose from a hotel room or one or two-bedroom apartments with full kitchens, laundries and balconies. Seoul Food's bibimbap comes highly recommended. The two-bed apartments have two bathrooms, a good option for groups. The king bed in my hotel room is comfortable, with great pillows and a choice of either air-con or overhead fan. It's all very pared back, in a neutral palette of grey, white and beige. The minimalist design attitude continues into the bathroom, where only the extreme basics (soap and shampoo) are supplied. Everything else is on demand, to keep costs down. With a combination of sweltering temps and croc-infested beaches, thank goodness there's a pool. It's open-air and unheated, no bother for this deep southerner. Happily, as most Territorians won't dip a toe in till it's above 30 degrees C, you should have the 17-metre pool to yourself for a morning dip. It's right beside the gym, on level six. Tapping in to Darwin's very young population, with an average age of about 30, the hotel is tech-savvy. Manager Steve Frichot says Elan aims to reduce clutter for a streamlined room. I think it's lacking by not having a clock anywhere, but you can use the room's phone to self-program a wake-up call. It will shortly become just one of a handful of Australian hotels that lets you check in and even unlock your room with your phone, and you will be able to order room service from Seoul Food, downstairs, through the TV, which is conveniently kitted out with a media hub with international power points (look, Mum, no chargers!). Wi-Fi is free for the first 20 minutes but then ups to $15 a day: not a rarity in Darwin. The 24-hour room service is supplied by Seoul Food restaurant and café, right beside the street-level reception. It's a sunny breakfast spot, serving a well-produced eggs hollandaise with good coffee to go. Seoul Food touts itself as Darwin's first Korean restaurant, kicked off by Choong Jae Lee, now a Northern Territory culinary ambassador. 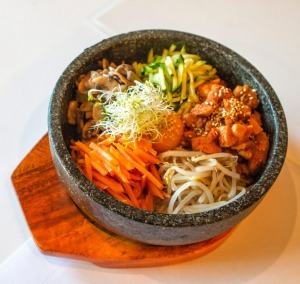 He tips the bibimbap, coffee-braised beef cheeks and crispy-skinned local barramundi. Sadly, I have a prior dinner engagement, but the restaurant is licensed: they had me at "Bombay or Hendricks?". It seems all of Darwin is at the Mindil Beach Sunset Market, which runs every Thursday from 5pm to 10pm and Sundays 4pm to 9pm until the last Thursday in October. Arrive with an empty stomach and shop the food vans for dinner: choose from a Sri Lanka curry or Greek souvlaki, a plate of oysters or paella, then head down to the sand to eat while watching the sun set (except if a cruise ship sails in front the sun just at the crucial setting point). See mindil.com.au. This hotel will appeal to self-caterers, small family groups and those who just want a fuss-free room. For the best water views, go for a high corner room in the 27-floor hotel. Manager Steve Frichot tips room 2504. 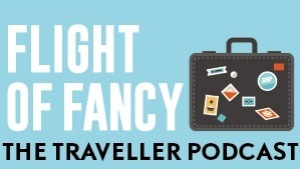 A warning: Darwin's hotels have been shamelessly pumped up by fly-in, fly-out gas workers, with seemingly bottomless pockets to pay for accommodation; dry (high) season prices are double the out-of-season tariffs. The trick is to travel in the shoulder months. Jetstar, Qantas and Virgin Australia fly direct from Sydney and Melbourne. Rooms start from $299 during the dry season, until October 31. The Dry Season package costs $339 a night with breakfast, two drink vouchers and late check-out. Elan Soho Suites is at 31 Woods St, Darwin, phone (08) 8981 0888. See elansohosuites.com. HIGHLIGHT Buzzing Seoul Food opens onto the street, so we chilled southerners don't have to dine in stale air-con. LOWLIGHT They say "uncluttered", you might say "spartan" defines the room décor. The writer was a guest of Elan Soho Suites and Sealink.